Materials play an integral role in the additive manufacturing process. Alongside hardware (from AM machines to post-processing systems) and software (including design and MES), materials form the third pillar to ensuring production success for additive manufacturing. Whether it’s engineering-grade thermoplastics or metal alloys, manufacturers are continuously on the lookout for materials that provide enhanced mechanical properties and part performance. Today, additive manufacturing is rapidly gaining traction as a viable production method, enabling the creation of highly complex products. Materials innovation will play a crucial role in bringing 3D printing into the realm of high-volume production. Fortunately, the range of materials available in the AM market is continually expanding, and already includes a diverse range of polymers, resins, metals, and ceramics. It can be difficult to keep up with the latest advancements in 3D printing materials, which is why we’re taking a look at 8 innovative materials for industrial 3D printing that have been unveiled so far this year. Carbon, the US-based company known for its Digital Light Synthesis 3D printing technology, is also a key player in the materials market. 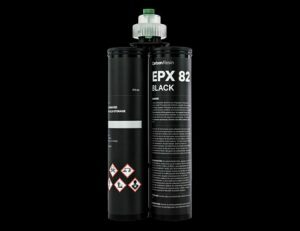 A recent addition to the company’s already extensive production-grade materials portfolio is its EPX 82 resin. EPX 82 is described as a high-resolution and high-strength material developed for engineering applications. With a combination of strength, toughness and thermal cycling durability, EPX 82 has a heat-deflection temperature between 104°C to 130°C. It is particularly suited for producing functional parts like connectors, brackets and housings for both the automotive and industrial sectors. The material also enables the creation of parts with flexible features and thin walls. Carbon’s DLS technology is known for its ability to produce parts with mechanical properties, resolution and surface finishes that rival injection-moulded plastics. The addition of the new EPX 82 material to Carbon’s materials portfolio further strengthens the technology’s capacity to create components that can withstand harsh environments, taking the performance of 3D printed resin parts to a new level. BASF 3D Printing Solutions has slowly but steadily been increasing its offerings in industrial-grade materials for 3D printing over the last year. This spring, the subsidiary of German chemical giant BASF unveiled a new polyamide material for Selective Laser Sintering (SLS): Ultrasint PA6 LM X085. In SLS, where PA11 and PA12 are the two most commonly used polyamides, this new nylon material from BASF could be a very valuable addition to the SLS materials’ catalogue. Ultrasint PA6 is a nylon powder with a comparatively low melting point of around 193°C. The low melting point of Ultrasint PA6 reduces the energy consumption for SLS machines and helps to speed up the printing process. Parts manufactured with Ultrasint PA6 exhibit high stiffness and strength and the material is typically used for automotive and consumer goods applications. The high-performance material, which goes by the brand name PrimePart ST, further expands the options for 3D printing applications. PrimePart ST is notable for its high elasticity and strength, and is compatible with High Speed Sintering (HSS) and binder jetting technologies in addition to SLS. Parts produced additively using Evonik’s new powder are said to demonstrate good flexibility, excellent chemical resistance and durability. Application areas for the new material include high-quality, fully functional, flexible plastic parts for prototyping or series production. 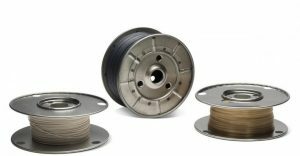 As the demand for high-performance thermoplastics increases, chemical company Solvay has developed three new polymer filaments specifically for high-end AM applications in the oil & gas, aerospace, automotive, and healthcare industries. The filaments, based on high-performance PEEK and PPSU plastics, enable the fusion of printed layers and possess a high part density and exceptional part strength – including in the Z-axis, which is typically a challenge for FDM. For example, Radel PPSU can produce parts with high heat and chemical resistance, making it suitable for medical applications or even hot water fittings. Notably, Solvay’s KetaSpire PEEK filament has been included in e-Xstream’s Digimat simulation software. Through this partnership, Solvay hopes to enable its customers to achieve successful prints when using its high-performing thermoplastics. 3D printer manufacturer EOS is now offering the first high-performance, carbon-fibre reinforced PEKK material for its SLS systems, developed in collaboration with Boeing. Launched at RAPID + TCT 2018, ALM HT-23 has been developed particularly for aerospace applications, enabling lightweighting and reducing the overall cost-per-part. According to EOS, ALM HT-23 can significantly reduce tooling costs by replacing aluminium parts with this thermoplastic. Aside from aerospace, ALM HT-23 is also well-suited for industrial applications that require high wear resistance and resilience under chemical stresses and where here heat resistance is required. This year, Nanosteel, a company operating in the field of nano-structured steel materials, has unveiled novel steel alloys with material properties that current 3D printable alloys cannot offer. The company formulated unique metal matrix microstructures in order to achieve enhanced properties in its materials. Nanosteel’s product line includes metal powders for powder bed fusion and metal binder jetting systems. For example, the BLDRmetal™ L-40 ferrous alloy powder, designed for use in laser-based additive manufacturing, can be printed at room temperature and can produce parts with high hardness and ductility. According to NanoSteel, BLDRmetal offers an alternative to difficult-to-print tool steels such as H13 and provides a superior performance to M300 maraging steel. With excellent physical properties, L-40 is a desired material for a number of applications, including tools, dies, bearings, and gears. Lightweight metal parts and components are in high demand, and Scalmalloy may just provide one solution to the growing need for lightweight yet strong and ductile metals. Developed by German-based company APWorks particularly for powder-bed metal 3D printing, Scalmalloy offers the lowest buy-to-fly ratio and a high strength to weight ratio. To date, applications for Scalmalloy include innovative brackets, motorbikes, and a bionic partition. However, with its material properties combining the lightness of aluminium with almost the same strength and ductility of titanium, Scalmalloy certainly shows its potential for the automotive and other transportation industries. ACEO®, a division of chemical giant Wacker Chemie, has already made huge strides in developing innovative silicone3D printing technology. With the introduction of fluorosilicone, the company has achieved yet another milestone. Fluorosilicone is a 100% elastomer that combines the resistance of fluorocarbons with the temperature properties of silicones. Fluorosilicone is the material of choice for sealing applications in industries requiring resistance to fuels, oils, and lubricants. ACEO®’s launch of fluorosilicone marks only the beginning of a line of functional silicones coming in the next couple of months, according to the company. The demand for greater innovation and superior materials is only set to grow as the 3D printing market matures. With material suppliers looking to capitalise on this demand, greater investment is being made into funding extensive R&D initiatives. This can only mean greater opportunities for the industry as a whole, as new materials, offering a wide range of mechanical properties, can help to accelerate the process of making additive manufacturing a fully viable production technology.